The 300 Committee purchased River Bend Conservation Area on Sandwich Road in the fall of 2007. The 10-acre parcel is a key piece in the goal of the town and the land trust to establish a pathway along the Coonamessett River. Once the pathway is formed, a trail along the length of the river will be possible. This parcel is unusual in its own right; it combines level grassy fields, a vernal pool, freshwater marsh, red maple-blueberry wetlands, and a wooded slope leading down to the water. A path winds along the stream and through an abandoned, overgrown cranberry bog, where the straight lines of the ditches of the bog are still evident. A sluice gate that served the bog also exists at the lower end of the property where Coonamessett River flows under Sandwich Road to Pond 14 on the other side. In the early 1900s, Hatchville was dominated by large dairy farms, and this property was part of Sunnyside Farm. Earlier, at the turn of the 19th century, a wool fulling mill was operated, reprocessing old woolen material. According to a survey funded by the Falmouth Historical Commission, the site constitutes the only documented wool fulling mill in Falmouth. After The 300 Committee bought the property, the sellers continued for several years to operate their kennel business, named River Bend after the turn in the river that flows below the house and kennel barn. In 2011, the kennels closed and the buildings on the property were razed, except for the ceramic silo, a unique structure that community members hoped to save. A funding campaign undertaken by this group raised enough money to restore the silo in 2013 and create a maintenance fund for its future upkeep. During that time, the trails at River Bend were expanded to create a modified figure eight, and bog bridges were built by volunteers to protect both the sensitive wetland habitat and the feet of visitors who walk on the parcel and enjoy its lovely river frontage. 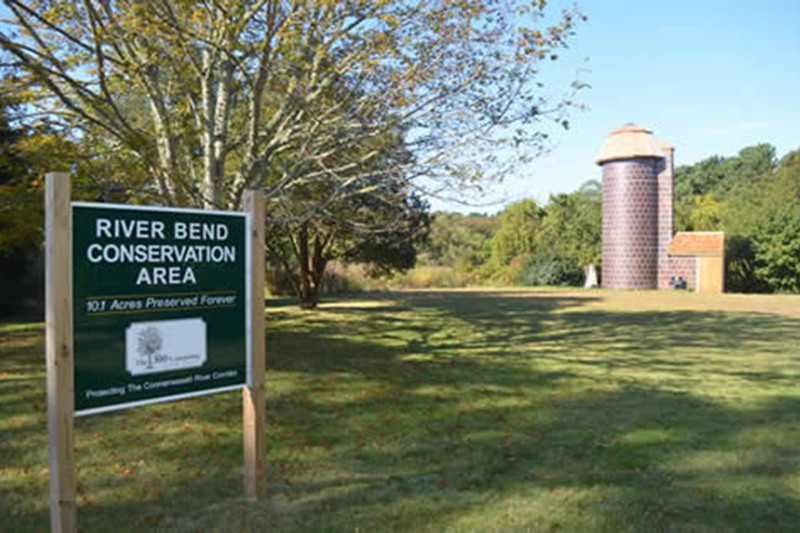 The River Bend Conservation Area is dedicated to the memory of Beth Schwarzman, a board member of The 300 Committee Land Trust from 2005 to 2012. Beth's extensive knowledge of natural history and geology was matched by her passion for for preserving natural areas such as this beautiful woodland. Beth expressed her passion through writing, trail mapping, leading walks and applying her tremendous energy to preserving open space. Beth envisioned a continuous green corridor along the Coonamessett River. River Bend is a key element of this greenway.